Taking a turn cheering and driving traffic to the Fancy Fruit parking lot, freshman Isabella Senn (right) shakes a poster at drivers on 17-92. 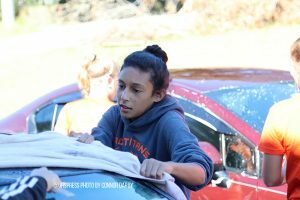 "I think the best part of the day was just bonding with all the girls while washing the cars because we were all listening to music and just having fun," Senn said. On Saturday, November 3, the girls’ soccer team’s annual car wash fundraiser occurred at Fancy Fruit and Produce in Orange City. Taking place from 9 am to 1 pm, the team raised a total amount in upwards of 800 dollars, which will primarily go to new uniforms, bags and equipment. Through pre-sale tickets and same-day sales, the girls raised a sizable amount which should offset the cost of future team expenses. Roughly 135 tickets were pre-sold before Saturday’s event. Anyone who went through the car wash without a ticket was encouraged to make a donation to the team. More than just a fundraiser, the car wash also provided the team a chance to bond and get closer to one another, with the presence of laughter, spraying each other ‘by accident’ with the hose and singing along to music. Teammates bonding with one another can help the everyone cooperate and dominate during matches. Saturday’s event gave the players a chance to practice their teamwork skills. In addition to drying off the cars, some of the girls also had to dry off after getting sprayed accidentally by whoever was holding the hose. 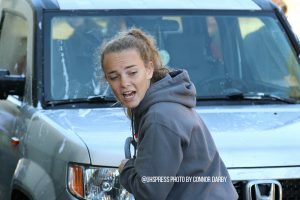 While getting sprayed with the hose could be a funny way to joke around, the hose itself was slightly awkward to wrangle, and whoever was in charge of it had to be careful not to trip her teammates while rinsing suds from the cars. Despite the unwieldiness of the hose, the team managed to have fun and take home a substantial sum in the process.